Full cancellation has no refund. Reduction in the number of guests is acceptable within 2 weeks before arrival with no extra charge. If modifications happen after that period full booking will be charged. 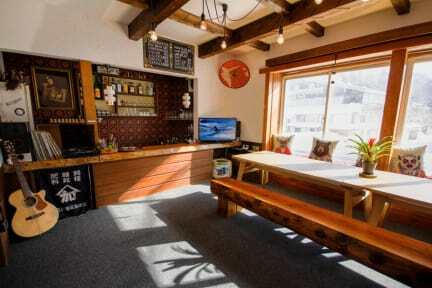 Cool hostel with a Japanese style. Only 3 min walk from the main Gondola at Tsugaike Ski resort in Hakuba. 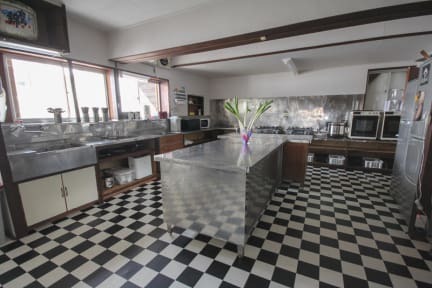 Great location close to Bus station, tourist information center, restaurants, convinience stores, Onsen and taxis. Small bar with pool table and tasty drinks that warm you up. Hai! Because it’s probably the first word you’ll learn. Hai means ‘yes’ in Japan and we believe ‘yes’ is a good word. Would you like a beer? “Hai!”. Would you like to shred the deepest powder on earth? “Hai!” Would you like to stay at a wicked lodge that is chilled, cheap and cheerful? “Haaaaiiiiiii!”. See, how easy was that? Come join us at Hai! Lodge and grab a beer, a bed and get buried! The place is super relaxed, with a friendly and chilled out vibe.